“Oh, wow!” With wide eyes and a big grin, the last student crests the hill and catches his first views of Conglomerate Mesa. Our group, a dozen strong, gathers at the saddle just below the Mesa’s summit. Bryan Hatchell, Desert Lands Organizer at Friends of the Inyo, squats down to point out a spring parsley in bloom. The mid-day sun is warm on our backs, but now the gentle breeze from the West convinces us to put our jackets back on. We are all happy to take a break and quietly soak in the view. 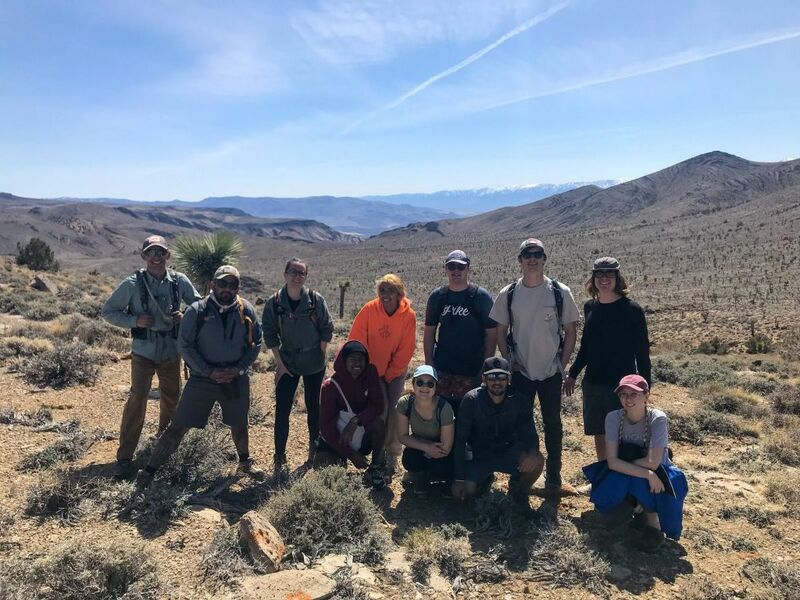 On Sunday, March 31st, Bryan and I led a group of nine California State University Long Beach students and alumni on a trip to Conglomerate Mesa. Together in our caravan of 4×4’s and pickups I led the group through familiar flats filled with Joshua trees and we watched as the landscape slowly transitioned to pinion-juniper woodlands. I thought back to my first time driving these remote backroads and wondered if the students behind me felt the same sense of adventure and awe that I had then, and still have. Once we arrived at the trailhead, Bryan led us up the trail. He spoke to us about the area’s unique ecology, its cultural significance to the Native American tribes, and the history of the early settlers and their charcoal kilns. He pointed out the mining claims marked by the wooden posts in the ground and shared about the threat of the open-pit gold mine. 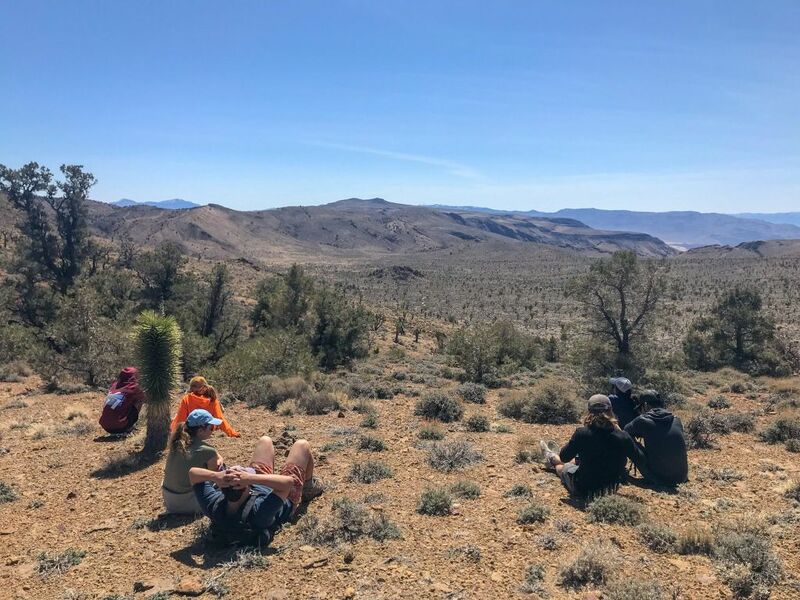 One student scribbled notes in his notebook while his partner took photos of a young Joshua tree at her feet. These students came up to work on a final project for their class to report on the mining threat (Learn more about the threat to Conglomerate Mesa here). But a few alumni who had already been to the Mesa joined us just to visit this special place again. The remaining students heard about the trip through the Environmental Science and Policy (ESP) Club–almost every one of these students and alumni studied ESP or Geography. I am very familiar with these programs as a CSULB alumnus, having graduated with my major in Environmental Geography and a minor in Environmental Science and Policy. In fact, the first time I ever visited Conglomerate Mesa was on a trip just like this one five years ago, organized by Dr. Monica Argandoña, Lecturer and Adviser at CSULB and activist in the California Desert. 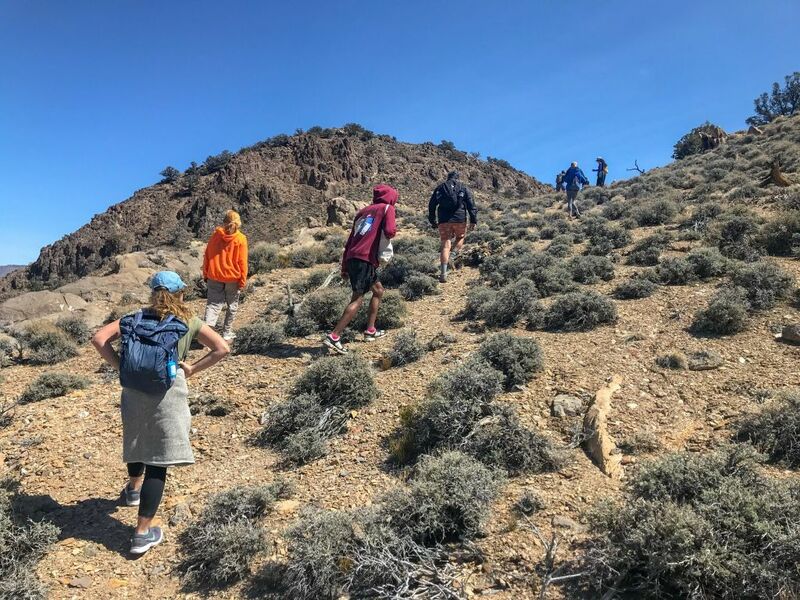 When I started at Friends of the Inyo, one of the first things I did was reach out to Monica, now a mentor and friend, to plan this trip for her students. I can confidently say that I wouldn’t have left my corporate job and pursued a job at Friends Of the Inyo had it not been for this very trip that I went on five years ago. I felt proud to be a part there and I felt inspired to join that fight. I had no idea that years later I’d be moving my life to Bishop and becoming a part of the team that is still fighting hard to protect Conglomerate Mesa. And who knows, maybe one of the students from this trip will make the move up here next….